The legend of King Arthur is eternal, and most have been captivated by the fanciful tale at one time or another. Growing up, I can recall my parents watching Richard Harris in the motion picture musical, Camelot. The soundtrack played on our hi-fi often. Little did I know, however, that many years later I would present in a National Geographic television documentary, The Truth Behind King Arthur. Even more astonishing, I never imagined that I would conclude that the once and future king never existed. 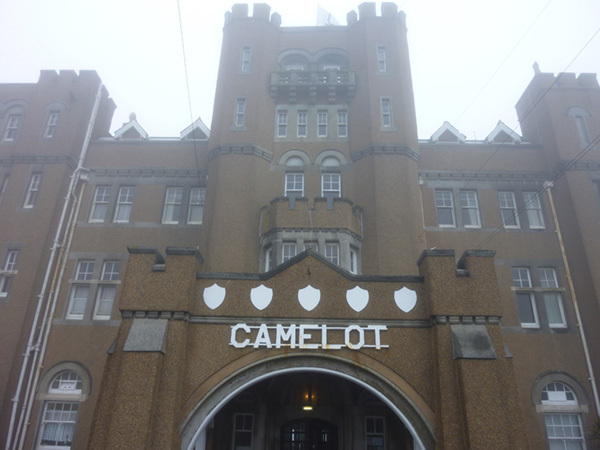 “In short, there’s simply not, a more congenial spot, for happily-ever-aftering than here, in Camelot.” From the musical ‘Camelot’. The helicopter sputtered and for a brief moment I felt that “don’t tell me this is how it ends” terror. I was hundreds of meters off England’s Atlantic coast and the cameraman was focused tightly on my face. “Whatever you do don’t look frightened,” I thought. The last thing I needed was a video outtake on You Tube entitled ‘Presenter soils himself over the Atlantic’. I maintained my cool for a time, and then lost my composure completely. As we circled Tintagel my attention could not help but drift to the Victorian mansion above the ruins known as Camelot Hotel. Sure, it was a blemish on the face of an otherwise breathtaking landscape, but what bothered me most was how its intruding presence seemed to permeate the rolling hills like a Jehovah’s Witness at the front door. It gave me the creeps, and when I mentioned to the locals that I was staying there they rolled their eyes and changed the subject. Not a good sign. As crowned heads go, Arthur is a relatively obscure king. Not much is known of him, yet inexplicably he is more revered than God, more admired than Barack Obama and more respected than Leonard Cohen. Still, I’ve known of ghosts with more historical credibility. There was no script, but one thing was certain; I was not going to drone on in that reverent tone reserved for beard stroking, pipe smoking historians with holes in their sweaters who wax lyrical about the once and future king. Nope, not me. Not a chance. To say that Arthur is an enigma is like saying the Chicago Cubs are underachievers. Some things just defy explanation. We first come across Arthur’s legacy in the 6th AD century when a chap by the name of Gildas Bandonicus (494AD – 570AD) writes about the Battle of Badon, the skirmish where Arthur is mortally wounded by his son Morded. Curiously, he never mentions Arthur, only an unknown leader who defended his nation against the Saxons. We have to wait a quarter of a millennium until Nennius (800 AD) tells us that the hero’s name was Arthur. It’s not until 1135 AD that the Arthurian story truly begins to unfold, and it’s Geoffrey of Monmouth who gets the party started. Monmouth is the first to mention that Arthur was born in Tintagel, that his father was Uther Pendragon, consort of Merlin, and that his wife was named Guinevere. He also introduces the final act of the play; Arthur’s death in Avalon, the mystical island of apples. Not a bad screenplay given all he had to go on was a two line treatment. The legend grows at a relative pace from this point onward. In and around 1155 AD a Norman poet by the name of Wace introduces the concept of the Round Table and the mythical sword known as Excalibur. Twenty years later Chretien De Troyes (1170 AD) introduces Arthur’s kingdom of Camelot, as well as the Grail, which he identifies as a platter, although he never referrers to it as holy. Another twenty years on (1190 AD) Gerald of Wales mentions that Arthur’s body and cross were discovered in Glastonbury Abbey, and ten years after that (1200 AD) Robert de Boron adds the Sword in the Stone that Arthur extracts, earning him accession to the throne. De Boron also transforms the grail into something holy, informing us that the grail was not only the vessel used by Joseph of Arimathea to catch Christ’s blood at the crucifixion but was the chalice used by Jesus Christ at the Last Supper. Come the early 13th century Wolfram von Eschenbach writes an account based on oral tradition. Unlike Troyes’s un-finished Grail Romance, he provides an ending and an alternative version of the Grail, which has been transformed from a platter to a stone from heaven. It is Eschenbach’s version that inspires the German composer Wilhelm Richard Wagner to write the opera Parsifal, which was admired by Adolf Hitler. Finally, in 1485, Sir Thomas Malory creates the quintessential version of the story, embellishing previous versions while infusing ancient Welsh texts to produce a tale that is pure Hollywood. Our aerial tour had just come to an end when our pilot, a former SAS officer, informed me that a senior UK official had disclosed the location of Grail and that we would drive past it on our way from Tintagel to Glastonbury. “Everybody has a theory about Arthur,” I mumbled, “And this guy even thinks he knows where the grail is hidden.” Cynicism aside, I later studied the ordinance survey map for clues but to no avail. I did notice that Tintagel, and Glastonbury – the enthusiast’s choice for Avalon – were located near the tributary associated with Arthur’s last battle, the River Camel, and both were dotted with place names beginning with ‘Cam’, as in Camelot, Arthur’s famed kingdom. I wondered if the fairy tale could be historically founded after all. Back in Camelot, the hotel that is, the film crew and I exchanged gossip about our grand but ultimately discomforting lodgings. 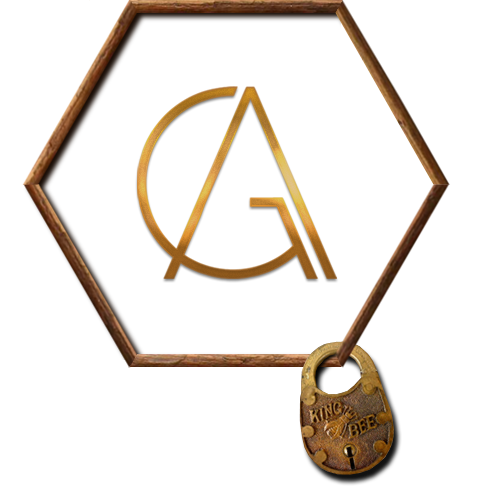 It seems the place is a favourite amongst Scientologists, and a haunt of Nicholas Cage’s, who lives near Glastonbury, and whose enthusiasm for the esoteric is as legendary as his record for drinking 16 Jaguar Juices, a potent concoction of local craboo liqueur, aged rum and fresh pineapple juice, at his father’s eco-friendly resort in Belize. Nothing wrong with Scientology or Cage’s bodacious record, especially since I only managed 8 Jaguar Juices when I visited. What troubled me most was the resident artist, who wore a white suite and asked tens of thousands of pounds for his gaudy pink paintings affixed with 3-demensional butterflies. Evidently he is the UK’s most adorned painter, although none of us had ever heard of him. And then there is the mystery of the ‘Light Box’, which is kept in the cellar, accessible only in the company of said artist. We were led to believe that the Light Box was one of the greatest mysteries in Cornwall and humbly requested admission on successive nights, only to be denied the privilege while other tourists were enthusiastically granted access. Like the sword in the stone, it would appear that we were amongst the majority who were deemed unworthy. The next morning we set out early to explore Tintagel in earnest, and English Heritage, who oversees the site, provided their most accomplished guide. 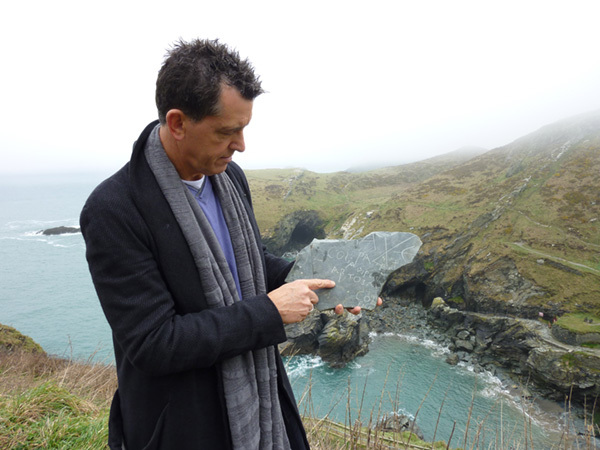 Foremost on our quest was the examination of the Arthur Stone, the lone artefact that suggests that Brittan’s greatest king may be associated with Tintagel. Knowing the fuss that would ensue, the archaeologist who discovered the slab in 1998 exclaimed ‘Oh no,’ as he read the inscription containing ‘Artognou’, which is generally regarded as is a reference to King Arthur. Actually, ‘Artognou’ means ‘Bear Knowing’. I was intrigued, given that ‘Arthur’ means bear in many Celtic dialects. This time, I wondered something altogether different than before. After filming a segment about the Arthur Stone we wandered off to inspect Arthur’s Footprint, an imprint in the bedrock that historians believe was used to usher in the new king while honouring his ancestors who were buried in the cemetery across the gorge. As we walked amongst the ruins our guide recounted a touching story about Richard Harris, the Irish actor who popularised the legend of King Arthur with his memorable performance in the musical, Camelot. 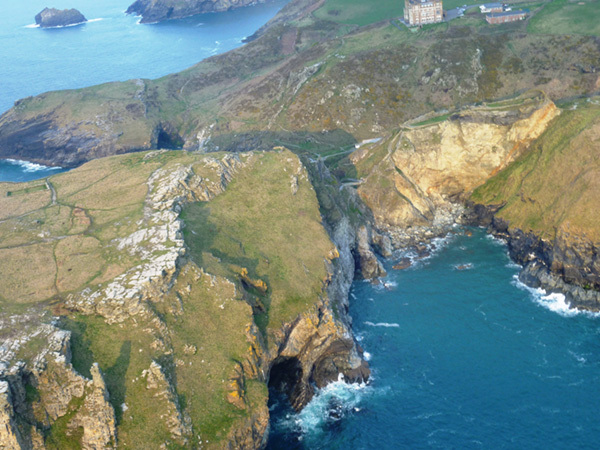 Many years later and now an old man, Harris returned to Tintagel for one last visit. He was escorted to the entrance in his wheel chair but in his condition he could go no further. He returned to London that night only to die the next day. I was touched by the story but not entirely sure what to make of Tintagel, for the Dark Age graffiti on the Arthur Stone is the only archaeological evidence that links the site to Arthur, and even that is tenuous. Sure there are pottery shards that date to the 6th century, and Monmouth tells us outright that Tintagel is the place of Arthur’s birth, but is that conclusive? On the other hand, the place is awe inspiring and if ever there was a setting worthy of Arthur’s birth place then Tintagel is it. In honour of the Richard Harris and Tintagel we grabbed a Cornish pastie (which is a kind of hand-held pie developed for the Cornish miners to eat on their lunch break, and utterly delicious) and hit the road for Glastonbury in search of the true Camelot. As we drove I kept a watchful eye out for the Holy Grail that the SAS pilot was on about. “What if it’s kept in a Welcome Break off of the dual carriageway?” I thought as we stopped for petrol. “Nobody would ever look there,” I mused as we stocked up on supplies. We arrived in Glastonbury with everything but the grail. The holy thorn tree at Glastonbury had recently been desecrated; its branches, which had been ripped off by a drunken vandal left nothing more than a stub. Only the freshly laid spirit ribbons provided testament to its former splendour. This saddened me greatly, for this is the place that first links Arthur with the area. 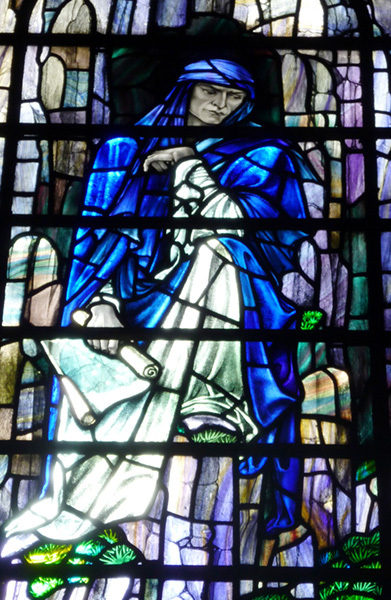 Joseph of Arimathea was a wealthy tin merchant who travelled to Britain’s West Country on business, and who is said to have taken his nephew Jesus Christ with him on at least one occasion, or so the story goes. Upon arriving in Glastonbury, Joseph, exhausted and weary from his journey, planted his staff in a hill, which promptly transformed into thorn tree. It is a species that is indigenous to the area and that blooms only twice a year, including Christmas time. The hill is appropriately called Wearyall Hill, and flowers from the thorn tree are delivered to the Queen every Boxing Day. We filmed a segment and headed for the abbey, another site that suggests that Glastonbury was once the domain of Arthur. 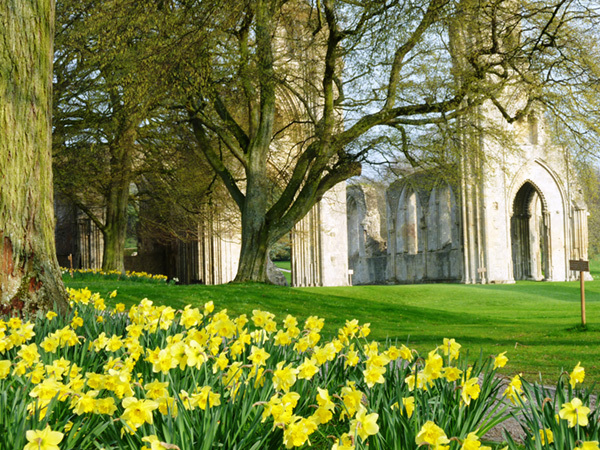 Glastonbury Abbey sits on the site of a church built by Joseph, the first outside of Jerusalem. A thousand years after Joseph and Christ visited Glastonbury, the monks of the abbey proclaimed that they had found the bodies of King Arthur and his wife Guinevere buried close to Joseph’s church. Given that the abbey had only recently been ravaged by fire, the claim was questionable at best. Thus, it is a combination of an indirect reference to Joseph being in the possession of the grail and his inclusion in the Arthurian Grail Romances, along with the monk’s claim Arthur’s body was discovered near the original church that makes Glastonbury interesting. There is something special about the place it must be said, and lest we forget it would have been an island in Arthur’s time and was known for its abundant harvest of apples. If Glastonbury was Avalon, one would be forgiven for assuming that Camelot was not far away. Not surprisingly, our perception of Camelot is skewed, thanks to Hollywood, as most imagine it to have been a walled castle with elaborate turrets, flying buttresses’ and a moat. The only problem is that those features were not invented until the 9th and 10th centuries, hundreds of years after the time of Arthur. 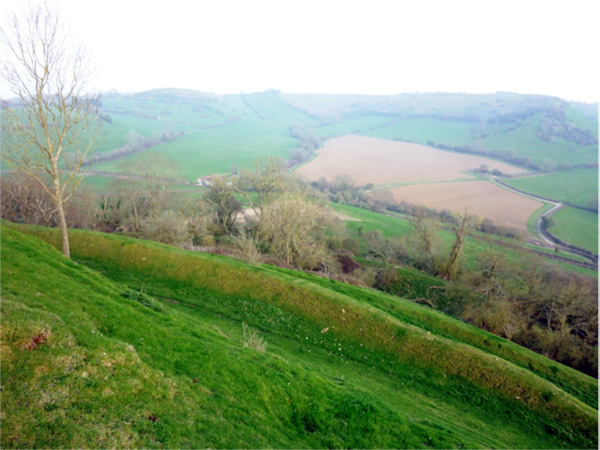 Cadbury Castle, which is visible from Glastonbury Tor, is believed by many to be the true Camelot. The place exudes realism, and although a gate and banquet hall were discovered that date from the time of Arthur, all that remains are four weathered dirt ramparts. For me, this rendering of Camelot is far more magical than the Walt Disney version, but like everything else in the story, its validity is frustratingly inconclusive. The notion of a magical ream called Camelot is resilient, if not eternal. Take for instance President John F. Kennedy, who believed that his administration was an incarnation of the Arthurian utopia and cited his favourite lyric as: “Don’t let it be forgot, that once there was a spot. For one brief shining moment, that was known as Camelot,” as sung by Harris in Camelot. Poignantly, in the days following Kennedy’s assassination his widow Jackie recited the lyrics, adding; “There will be other great presidents. But there will never be another Camelot.” I suspect she was right. In preparation for the final scene of the documentary I reflected on what I had learned and sensed about the legend. The truth is did I not believe in a single historical figure known as King Arthur. If he did exist, I suspect he was a composite of historical figures spanning hundreds of years and different regions and countries. Rather, I am inclined to believe that Arthur is an archetype, based on the celestial play observed in the constellation of Ursa Major, the Great Bear, meaning Arthur. Ancient man would have observed the great dipper, which resembles a platter; the object that was considered to be the Grail in the first ever account, rotating around the Pole Star, promising to return just like Arthur. And of course the notion of a return from death is messianic, reminiscent of the life of Jesus Christ. The night sky also includes an outline of a man with a wounded thigh, which sounds an awful lot like the Fisher King, as described by Eschenbach. And of course Arthur fought 12 battles and there were 12 knights of the ‘round’ table; one for each of the 12 constellations perhaps? And as we have learned, Artognou means ‘Bear Knowing’ in old English. There is more, but you get my drift. I believe he never existed. Sorry. For a second it was as if the great King himself was speaking through me. I finished with a flourish. Some members of the crew had tears in their eyes and I can’t say I was unmoved either. My observations had resonated, and I wondered if had I over intellectualised my earlier ‘as above so below’ conclusion. Did I believe in Arthur after all? I was not sure. All I knew was I sounded like those pompous experts, the ones who spew platitudes of pretentious rubbish when talking about Arthur. “Had I really just said that?” Inexplicably I had, and thus the only real conclusion I could draw was maybe, just maybe, there was some magic left in Camelot after all.